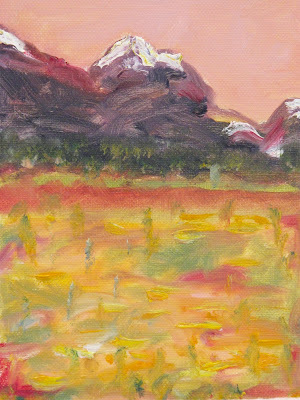 This oil painting of the mountains in Colorado is from my personal collection - one of only half a dozen I ever did. As it may be on its way to a new home, I wanted to share the sentiment that returns each time I see it. I can immediately recall the higher energetic vibrations one experiences when hiking alone at an altitude of around 9 or 10 thousand feet above sea level. There are flashes of tapping into what I can only refer to as source energy. With that there may occasionally be flashes of insight or clarity surrounding issues you may not even be ruminating about in the moment. These experiences, though rare, are gifts that stay with you a lifetime. They serve to inform your practice of mindfulness and the pursuit of inner serenity. Namaste fellow bloggers, creators and dear friends.